Most rice varieties require a long, hot growing season. But farmers as far north as Maine are experimenting with short-season heirloom varieties from Japan. A field of autumn rice. So nice. Arguably the world’s most important food crop, rice may conjure up notions of terraced paddies in Indonesia and bowls of vegetable curry, but the grain has deep roots in American history – particularly African-American history – and is enjoying something of a renaissance among small farmers. Contrary to popular conception, flooded paddies and tropical conditions are not required. And unlike, say, quinoa, rice is productive enough to be worthwhile on a backyard scale: a 10 by 10 bed yields about 10 pounds. As the base for dishes from Lowcountry purloos to Cajun jambalyas, rice remains a dominant staple of Southern cuisine, though it once rivaled cotton for dominance in Southern agriculture. Slaves brought knowledge of rice cultivation to America, along with ancient African varieties, which began to disappear after the Civil War when the loss of free labor put an end to profitable rice production in the region. Charleston Gold, the most renowned of those varieties, was all but extinct until a handful of organic farmers revived it in the late nineties. In recent months, news that red bearded rice, another long-vanished strain, was rediscovered in Trinidad by the Gullah chef B.J. Dennis has set the culinary world abuzz. Most rice varieties require a long, hot growing season – California, the Deep South and the Mississippi Delta region are the current centers of domestic production – though small farmers as far north as Maine are now growing short-season heirloom varieties (those that mature in 120 days or less) from northern Japan. Low-lying poorly drained land is ideal for “lowland” varieties, but even these do not require a flooded paddy, just soggy soil. Choose an upland variety if your soil drains freely. In northerly climates, sow rice seed indoors in early spring to get a head start on the growing season; in warmer climes, sow the seed outdoors where it is to grow once all danger of frost has passed. In either case, soak the seed in a bucket of water for one week prior to sowing (changing the water each day and discarding any seed that floats to the surface) to aid germination. Plan on 1 ounce of seed per 100 square feet of growing area, or about 30 pounds per acre. Aim for 3 to 4 seedlings per foot in rows spaced 1 foot apart. 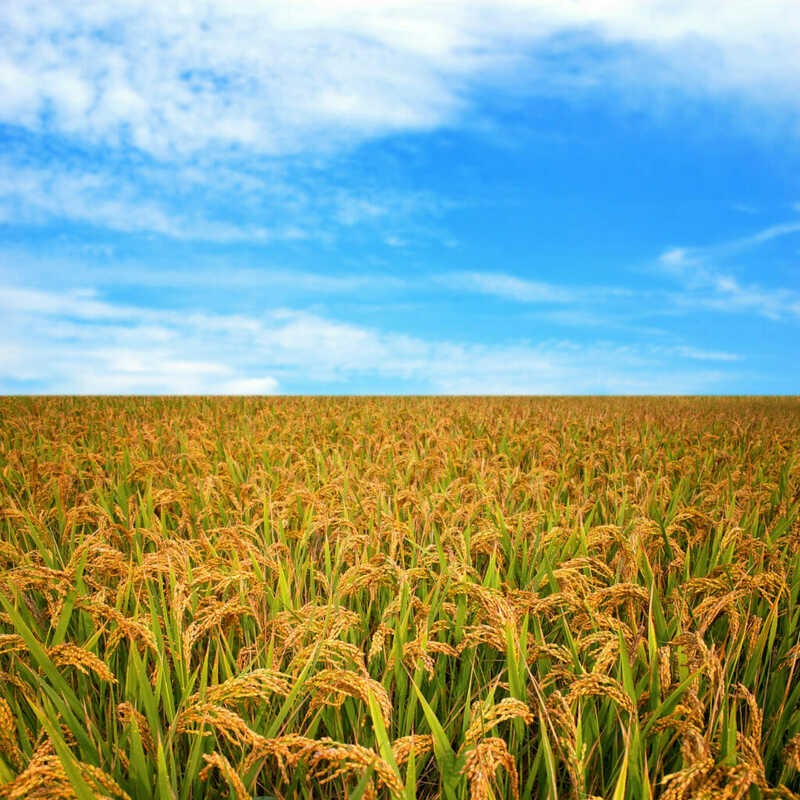 Maintain rice plantings free of weeds and irrigate as often as necessary to keep the soil moist. Both requirements are aided by a 3- to 4-inch layer of straw mulch, which may be applied as soon as the seedlings are at least 6 inches tall. Once the seedheads turn brown in late summer, cut them off with about 1 foot of the stalk attached and hang them in bundles to dry in a greenhouse, barn, kitchen, or other warm, protected location. After two weeks, separate the grain from the seed heads (threshing) by banging the bundles onto a tarp spread over a hard surface like concrete. Collect the grain and remove the remaining bits of chaff (winnowing) by pouring it into a bowl in front of a fan – the breeze blows away the lighter plant material as the heavier grain falls (this process may need to be repeated several times). Spread the rice on oven sheets and roast for approximately one hour at 200 degrees. The inedible hulls may be removed manually by pounding the grain with a wooden mallet, rubbing it between your hands to remove the loosened hulls, and then using a fan to blow off the chaff, as above. For larger quantities, avoid this time-consuming approach by purchasing a grain grinder with a de-hulling attachment (see www.grainmaker.com for a hand-cranked model).